My mother, in the process of reorganizing her office, recently gave me a stack of family pictures and documents. 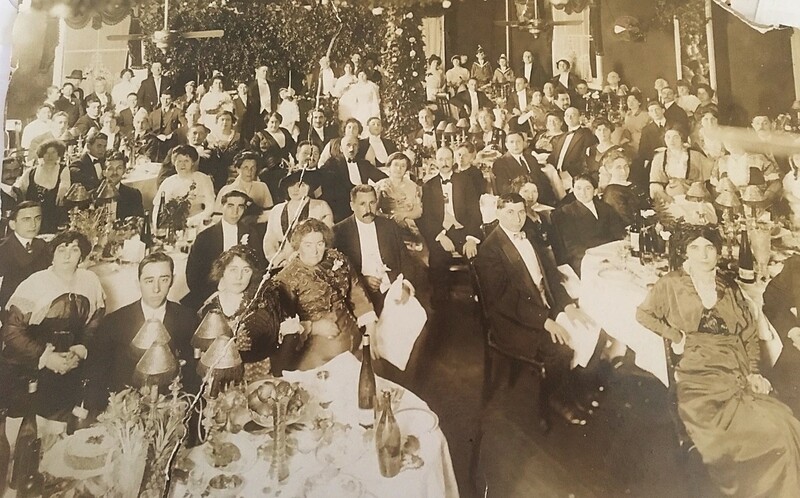 I had already seen many of these photos of her parents and grandparents, but there was one that was unfamiliar and amazing: a large photo of my grandfather’s Bar Mitzvah dinner held on 16 November 1913. 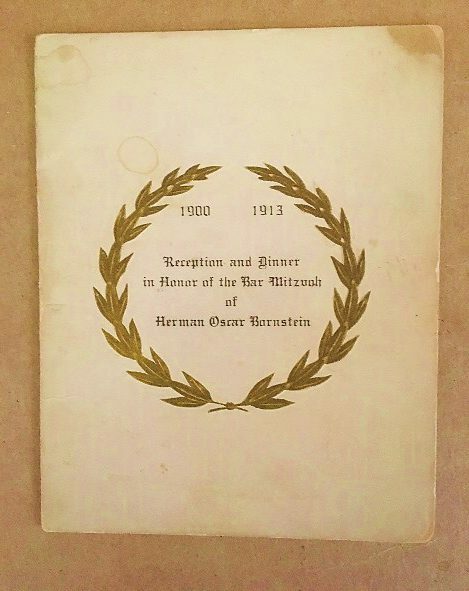 I didn’t even know that my grandfather had a Bar Mitzvah, but Herman Oscar Bornstein, born 12 November 1900, was celebrating at what looked like a very fancy dinner. 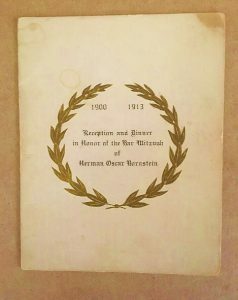 Not only did my mother have this photo, but she also had a menu of the dinner, presented in a little booklet. 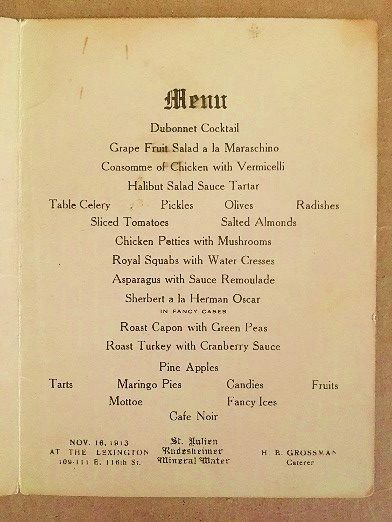 The menu included such items as Halibut Salad Sauce Tartar, Royal Squabs with Water Cresses, Dubonnet Cocktail, and my favorite: Sherbert a la Herman Oscar in fancy cases. A detail, showing Herman and his parents at the back of the room. 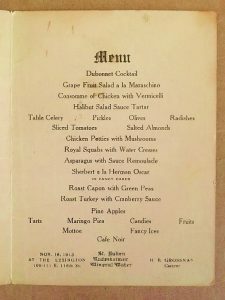 The menu booklet indicated that the party was held at the Lexington, located at 109–111 East 116th Street in Manhattan, but some online searching did not yield any information about this venue. My grandfather Herman had three sisters: Rose, Helen, and Winnie. By 1920, Rose, the eldest child, was no longer living at home; Helen was a bookkeeper at Teachers’ College; my grandfather was an office clerk at a fur house; and Winnie was still in school. A 1923 passport application stated that my great-grandfather was planning to travel all over Europe for six months on business as a merchandise buyer. Eventually, he was a proprietor of a millinery business. Later, my grandfather also had his own millinery business located in Manhattan’s fashion district, working there, along with my grandmother, until his late 80s. 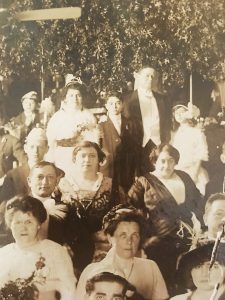 When researching my family history, I have found that I get caught up at looking at the bigger picture: where did this ancestor come from? Who were their parents? I think this photograph affected me so strongly because it reminds me to also think about the smaller “facts.” How did they live? What was life like? 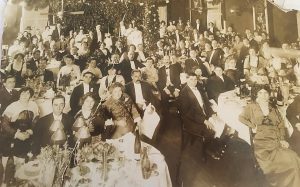 To discover that my grandfather had participated in this rite of passage, and to be able to see how they celebrated his hard work preparing for it – more than 100 years ago! – is just, well, cool. This wonderful picture so ably captured the moment of this celebration: The people decked out in formal attire, the proud parents, and my grandfather looking appropriately overwhelmed. And so much wine! It is very cool, what a great find, thanks for sharing! I suppose some of the others in the photo may be extended family. It is wonderful to have these photos come down to a descendant who at least knows something about who is in the photo primarily. It can be shared to future generations to carry on the story possibly, otherwise we would never have known about it with snapshots such as these. And great exciting time for you now. Thank You for sharing with us! I love old photographs that tell the small details. I recently came across a photograph of my mother (1957) which I have seen before. But this time I really looked at it, at the details. And it is in the details that the photo really tells the story — for example, I can see a Newsweek magazine on the coffee table. A subscription was an annual gift to my Dad and he subscribed for decades. Today details get photo shopped = sad. What a find! Thank you. I love that “sherbet a la Herman Oscar”- wonder which was his favorite flavor? ?